First Nations Development Institute’s “My Green” campaign helps Native youth learn how to take charge of their money – and begin to walk the path to financial wellness. As part of this financial education campaign, First Nations sponsored a contest in early 2013 where the grand prize was a pair of shoes that made that journey a little easier. Sarah and her team didn’t have to look very far. Last year First Nations worked closely with young artists on a “My Green” financial education poster project at Miyamura High School in Gallup, New Mexico. One student had an interesting hobby that got them thinking. Erin Bulow, 17, hand paints colorful designs on tennis shoes. It turns out that custom-painted shoes are “all the rage” these days. 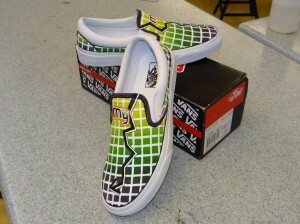 In fact, there’s even a national shoe-painting contest for high school art students that is sponsored by Vans, a popular tennis shoe company. 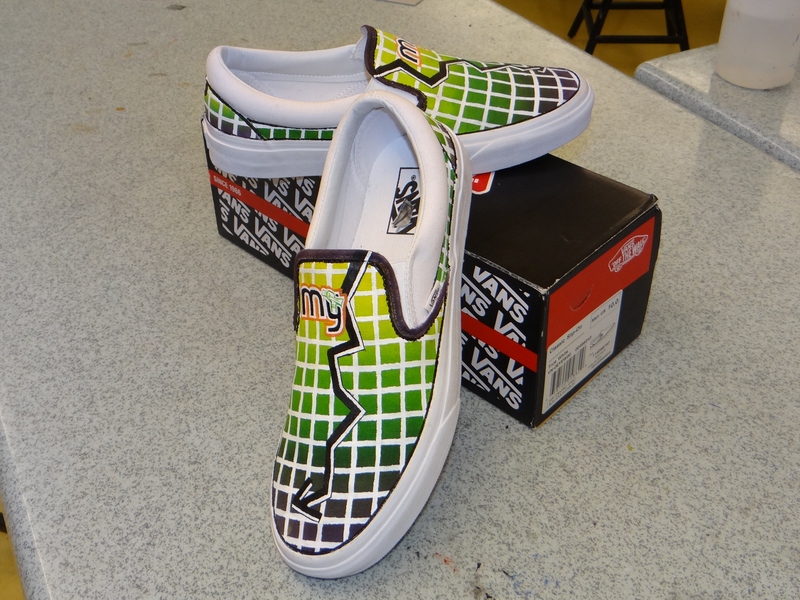 The Vans “Custom Culture” program is a national shoe-customization contest where schools from all over the U.S. compete for a chance to win money for their art programs, and usually has about 2,000 schools participating. Miyamura High School entered this year, and so did the Early College Academy at the Native American Youth and Family Center in Portland, Oregon (NAYA Early College Academy is another school with whom First Nations partners to provide financial education programming). First Nations hired Erin, who is originally from Zuni Pueblo, to design a one-of-a-kind pair of “My Green” shoes to serve as a prize for the contest. Erin comes from a family of distinguished artists – his grandfather was Duane Dishta, a well-known kachina carver and silversmith, and his mother is an accomplished painter and potter. In addition to shoe painting, the high school senior carves fetishes, makes pottery, silversmiths, and enjoys photography and writing short stories. 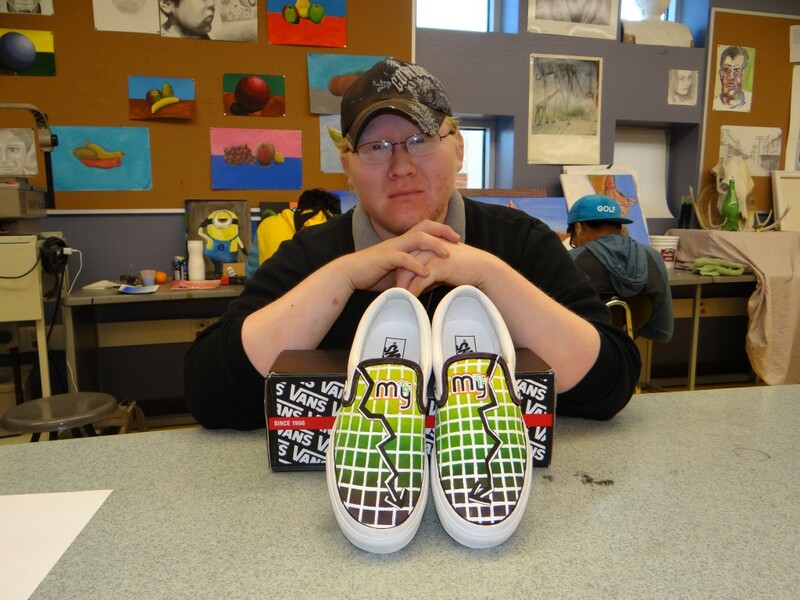 To date he has created more than 20 pairs of custom-painted tennis shoes that he sells along with other artwork through his website, BuffaloMedicineTrading.com. It’s been said that the secret to a fulfilling life and rewarding career is doing what you love. Erin Bulow has figured this lesson out a lot sooner than most. Our lucky contest winner got to think about taking a walk in his shoes – in more ways than one. This entry was posted in Uncategorized and tagged Custom Culture, Erin Bulow, financial education, First Nations Development Institute, Miyamura High School, My Green, Sarah Dewees, Shawn Spruce, shoe customization, Vans, Zuni Pueblo by rblauvelt. Bookmark the permalink. but the website is unknown. Was it reported incorrectly? I am the artist and I am sorry for the complications of my website. I have since made a new website that has my art and contact information on it.